Thanks to Relevant Children’s Ministry for this article. Christmas is such a great time to share God’s Word with kids and families. There is a heightened awareness of spiritual matters. Even with the secularization of Christmas, there is still much more proclamation in the culture of the story of Jesus’ birth compared to other times of the year. Children form many memories during the Christmas season that will stick with them for life. As an adult reading this, I’m sure you remember things from your childhood Christmas experiences. It’s obviously very important to teach kids the true meaning of Christmas and even more important to equip parents with stories, object lessons, etc. that they can share with their children during the Christmas season. One of the best ways to help kids remember Biblical truth is to tie it into something they are already familiar with. 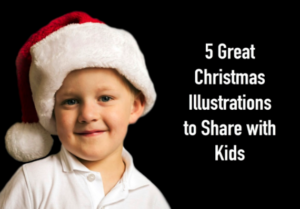 Each of these illustrations uses familiar Christmas items to teach kids God’s truth. If you will use these illustrations, it will stick in kids’ long term memory and each Christmas, even into adulthood, they will remember what you taught them when they see the object you used. These are great to use for children’s services and classes, family services, Christmas eve services, family devotions, Christmas morning, family dinners and more. There is a legend that the candy cane was first created in the 18th century by a candy maker. He wanted to share the true meaning of Christmas with the children in his town. He prayed and ask God to help him find a way to do this. His prayer led him to an idea – the candy cane. Christmas wreaths have been used for hundreds of years. They are hung on doors, over mantles and in windows. The wreath is made of evergreens, most often pine branches or holly. This symbolizes growth and everlasting life. The wreath is circular. This also represents eternity, for it has no beginning and no end. Holly branches have thorns. When used in the wreath, it represents the thorns in Jesus’ crown when He was crucified. Holly branches also have bright red berries. This symbolizes Jesus’ blood that He shed for us. Kids love gingerbread men at Christmas. They like to bake them, decorate them and of course, eat them. But did you know Gingerbread men can have a spiritual meaning for kids as well? The gingerbread men is created (mixed, baked, etc.) This reminds us that God created us. Adam and Eve were the first two people created. Gingerbread men are the color of the earth. This reminds us that God created man from the dust of the earth. Gingerbread men don’t last forever. We are mortal here on the earth. But if we know Jesus as our Savior, one day we will live with Him forever in heaven. Of course, one of the biggest parts of Christmas is the gifts. Buying them. Giving them. Getting them. Returning them (ha). There are many ways you can use Christmas gifts to show kids the true meaning of Christmas. Jesus is the gift of salvation. Eternal life is not something that is earned through our own works. It is a free gift that is based on Jesus’ righteousness. We accept it through faith in Jesus’ death, burial and resurrection. The wise men brought gifts of gold, frankincense, and myrrh to Jesus to honor Him. We can also honor Jesus by bringing Him gifts of our time, treasure and talents.